Sitting in the cool, crisp, December night air on my back deck the other evening I was letting the events of 2002 scroll through my head. It's been a tumultuous year for this industry and the dust isn't settled yet. My income was off 38.7 percent this past year. Honestly, it felt like much more than that. One of my best magazine clients actually called me only twice for work. Those are scary things to think about especially when you've just turned 53 a few days prior. Funny things start to run through your head. Things like; what will I do if I have to start over. How could I ever do anything else? Those my friends are scary thoughts to ponder. It's clear that there are way too many practicing photographers and want-to be photographers all vying for the same work these days and that isn't going to change in the near future. Every year the journalism schools in this country pour out another 6000 students into the ranks of job seeking photographers. This fact in itself is ridiculous. How any self respecting journalism program can direct students into this profession and say that they have the chance to succeed when most of those very same programs don't even require any kind of business related study to accompany those degrees, is even more ridiculous. 2002 has seen more photo related businesses go under than any other year in the past 2 decades. There are too many faces of friends and associates that I remember seeing when I started freelancing 10 years ago, that are no longer present in any of the venues that I continue to frequent. Even some of what I would consider to be the most business savvy companies are holding on by their fingernails. Just 5 days ago, one of the finest agencies in the industry, Matrix, announced that it is going out of business. The owner of this photo agency, Barbara Sadick, was one of the most trust worthy, hard working, industry savvy, people I've ever had the pleasure to know. But now, due to a terrible economy, a lack of technological advancement, limited working capital, and some just plain bad breaks, she has been forced to leave the business after almost 2 decades. 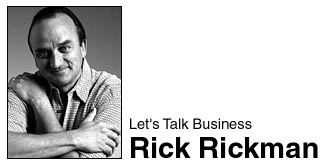 So you say, "After unloading all this cheery news on us Rick, what is it exactly you're getting at?" Well guys, I've been sitting here in this totally dark room, the computer screen throwing off the only light to be seen in the entire upstairs and I have to say, I don't actually know what I'm getting at. All I really know is this: there are more and more people out there who want you to work for very little money while their profits continue to skyrocket and at the same time want you to sign the rights to your work over to them. If you are willing to do work in that manner, you probably will be another name on that rapidly growing list of names that no-longer are practicing photographers. If you continue to sign bad contracts that take your rights from you, justifying those signatures by saying, you need to do this to get into the business, you are sadly misguided and are soon to be a "ghost image" in what remains of the journalistic profession. There are only three things that will get you into this profession in any meaningful way. The first is just plain tenacious hard work. The second is a never-ending effort to improve your vision and creativity by constantly producing the best images you can from every opportunity you are given. The third and probably most important is in this present market, a clear, intuitive, and vigilant understanding of good business practices. Ask yourself a question. Do you love what you do? If your answer was yes, then ask yourself another: Are you willing to loose that love by default? If the answer to that question is no, then ask this of yourself: Do you intend to be in business in 2 years? In 5 years? In 10 years? If yes is your answer here, then its time to get serious. Get serious about improving your vision, enhancing your creativity, and finely tuning all your business skills. GET SMART or GET OUT! I guess that's what I'm getting at here.